Video: Juan Williams on The O’Reilly Factor. FNC gives Juan $2M contract, expanded role; hosts Friday Factor. Videos: Megyn vs CAIR’s Hooper; Kelly’s Court: can Juan sue? Juan Williams: I was fired for telling the truth. Greta: NPR was really stupid. Kristol: unfair, unbalanced, afraid. Beck: it’s a message to Fox. Huck to boycott NPR. Chris Wallace w/Imus: NPR was out to get him. Colmes backs Williams. Bernard Goldberg: killing liberalism. Echoes of Shirley Sherrod. Did NPR act on 45-second clip? Zurawik: a shame. Morning Joe discussion. NPR should rehire Williams? Kurtz: fired not for what he said, but where he said it? Yglesias: glad he’s gone. 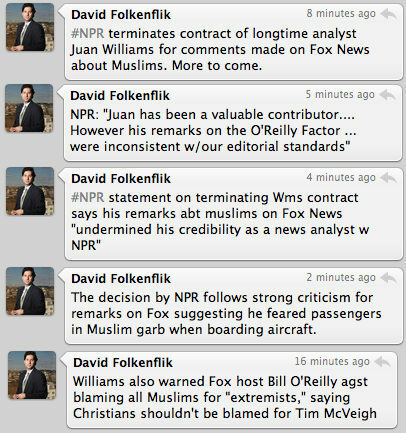 Breaking: NPR fires Juan Williams over O’Reilly appearance: update. NPR internal memo. NPR CEO: Juan should talk to his psychiatrist. Next target: Mara Liasson. Clayton Morris and Natali del Conte tie the knot. Cenk’s Countdown ratings sink, MSNBC gives him a promotion! Maddow apologizes for Stockman slur, blames editing error.